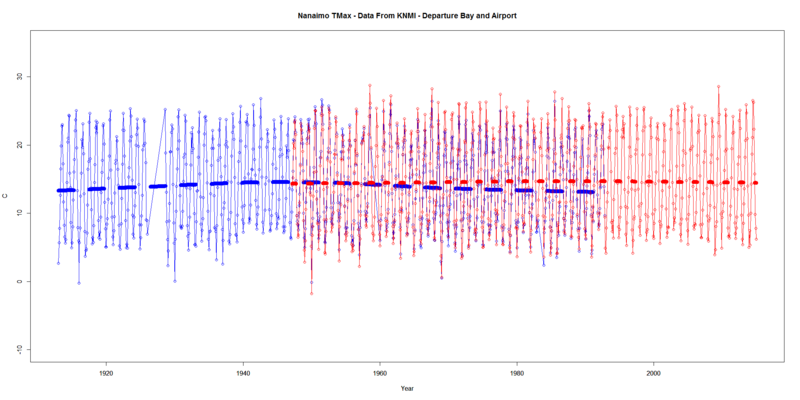 Today I am looking at daily data (using KNMI) from Departure Bay (1913 – 1992) and Nanaimo Airport (1947 – 2014). I’ve summarized the data by monthly mean. Every once in a while I visit the data for the weather station closest to my hometown on the west coast of Canada. 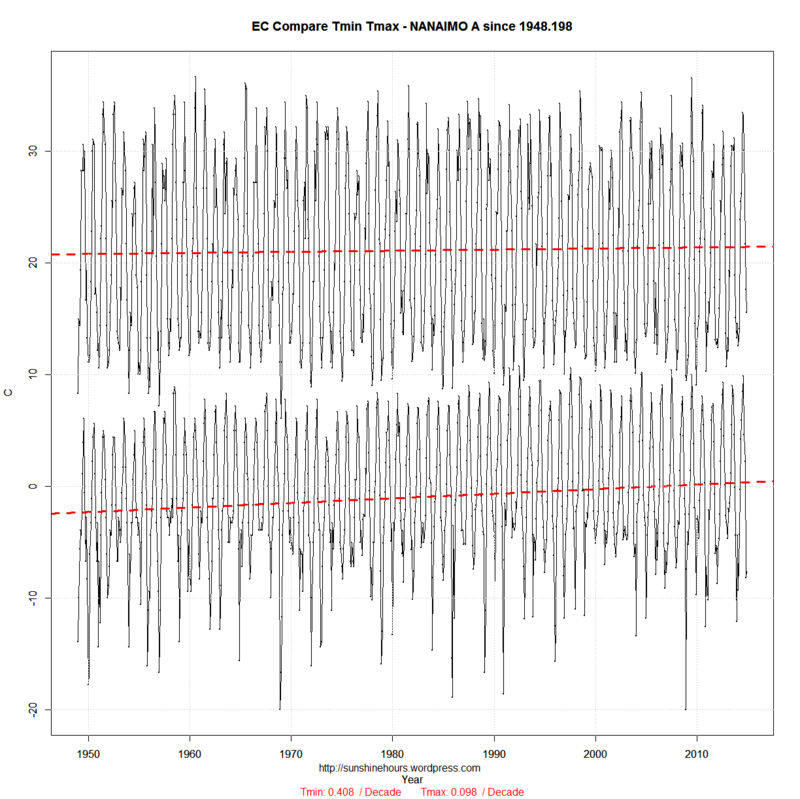 The data only starts in the late 1940s so there is no extreme’s from the 1930s and 1940s. 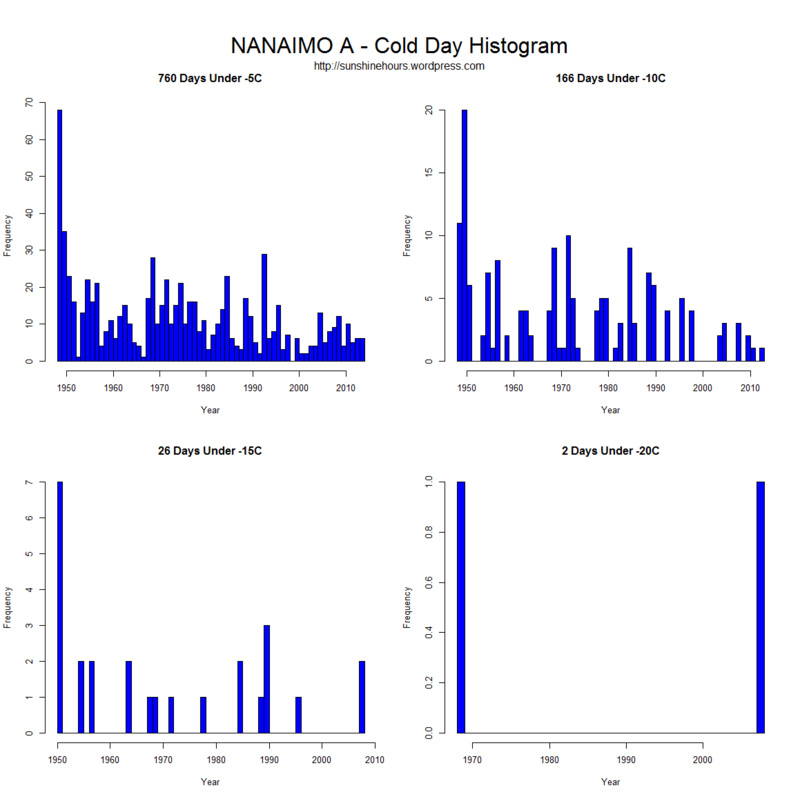 The three graphs below have the Tmin and Tmax data from the Environment Canada monthly reports up to the end of 2014. The three start in 2010, 1998 and 1980. What does the data tell you? If you start in 2010 … we are going to bake to death. If you start in 1998 … we are slowly cooling. If you start in 1980 the Tmin is climbing and the Tmax is dropping. UHI probably. You all know that the AGW cult likes to go on and on about “Extreme Weather” because the warming stopped in 1998 and they like to think the world is coming to an end and only they can save us. Just another end of the world cult. So I thought I would look at the same data for the weather station closest to my hometown on the west coast of Canada. 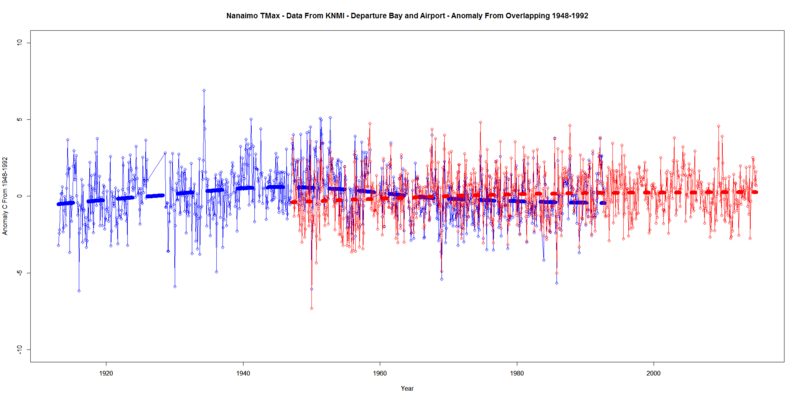 The data only starts in the late 1940s so there is no extreme’s from the 1930s and 1940s. One thing to remember. 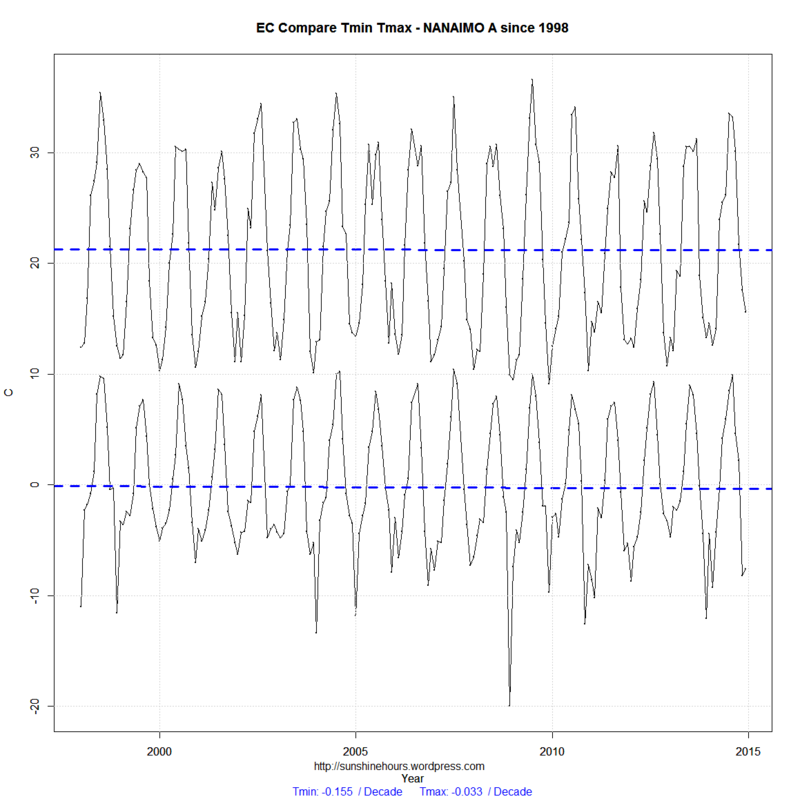 The 2361 Days Over 25C number (for example) includes the 506 Days Over 30C etc. I don’t see any increase in extreme hot days. I don’t see any increase in extreme cold days. Aside from 2 hot days in July 2009 (matched by the 3 days in the 1960s) and 1 cold day in 2008 matched by a day in 1968 it seems to have been getting less extreme. According to PNAS and the NSF and the Daily Mail, Genghis Khan conquered Asia because an ideal combination of warmth and rainfall caused grass production to rise..
All this conjecture about perfect weather leading to huge crops resulting in Genghis Khan conquering of Asia comes from the tree rings of only 17 trees. The incredible leap in logic from 17 tree rings is breathtaking. Maybe some goat herd tethered goats to the trees and the urinated on them. There are many explanations for why a few trees grew better for exactly 14 years. But even more amazing is that the lesson “we” the gullible should learn is that extreme weather will bring drought! The stupidity is alarming. 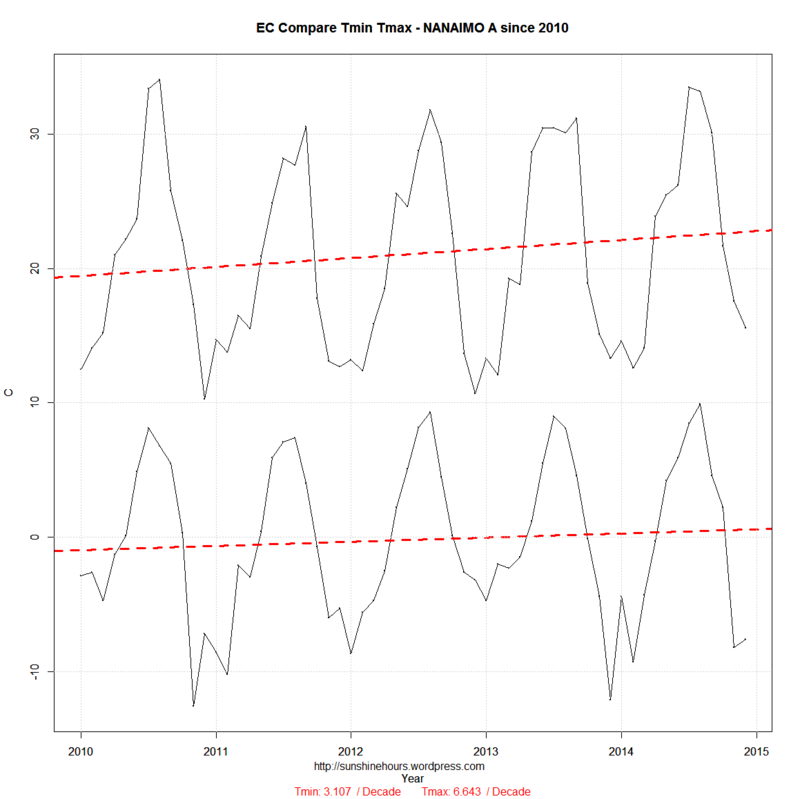 First they claim than natural variation in climate brought warm moist conditions to Mongolia and in fact brought perfect growing conditions … and their conclusion is to worry about drought and extreme weather. What a waste of grant money. The AGW cult likes to talk about “extreme weather” as if that is a new thing and all was nice and calm in the past before that evil CO2 came along. What a load of bull. 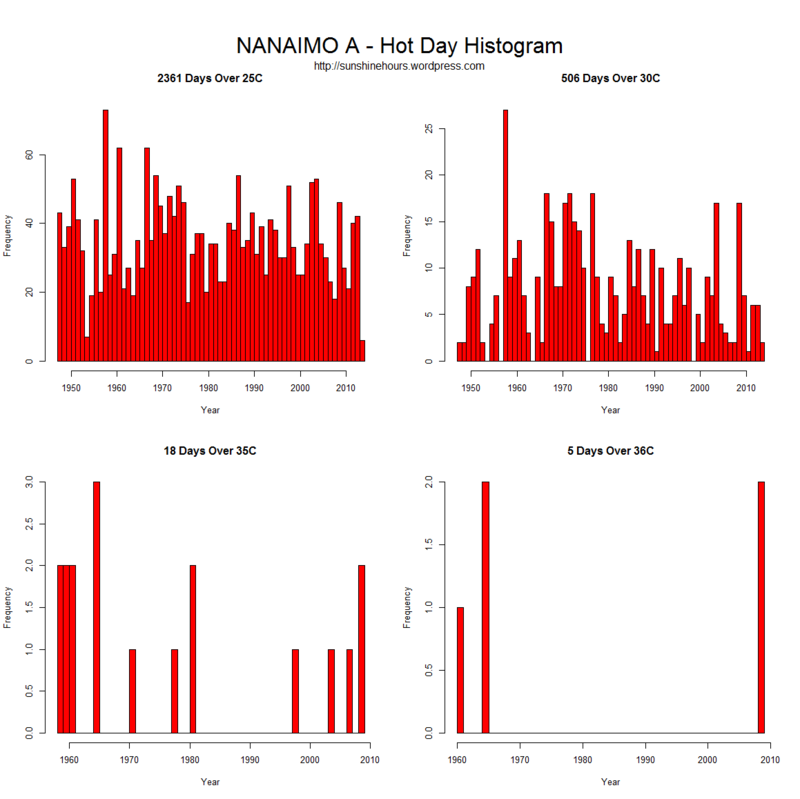 Inspired by my own post about 1930 temperatures in Canada and Steven Goddards post about “extreme weather” in Montana in 1936, I thought I should take a quick look at 1936. Imagine you are in the middle of the worst 10 year heatwave ever in North America — the dust bowl — and along comes February 1936. 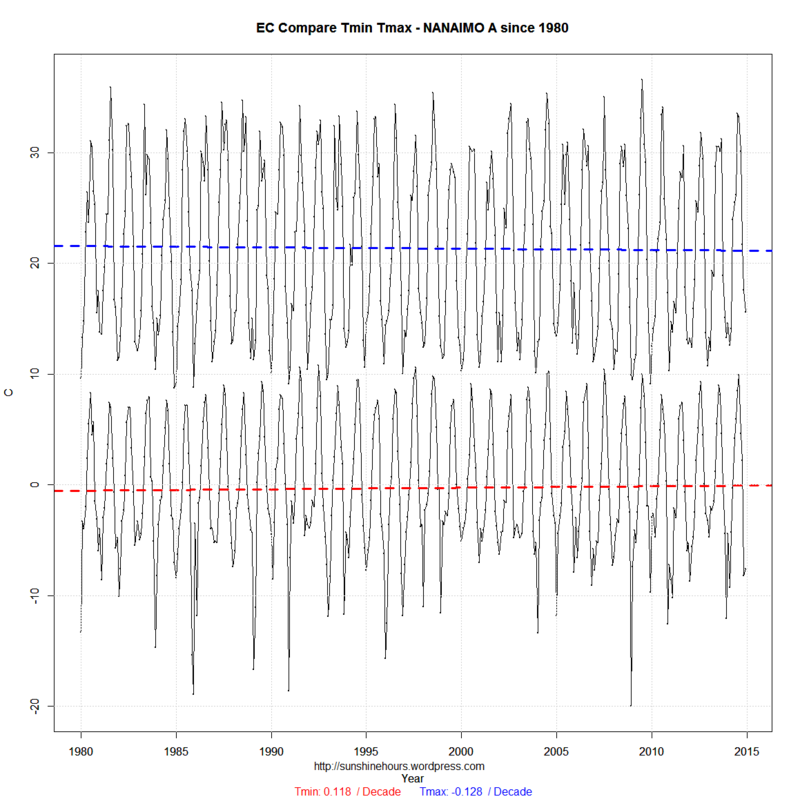 The data in the graph below are monthly averages based on the 1971-2000 normals Canada uses. The black dot in the top left hand corner is about 5C of difference above or below the normal for that month. Of the 184 stations, 3 were above 0. 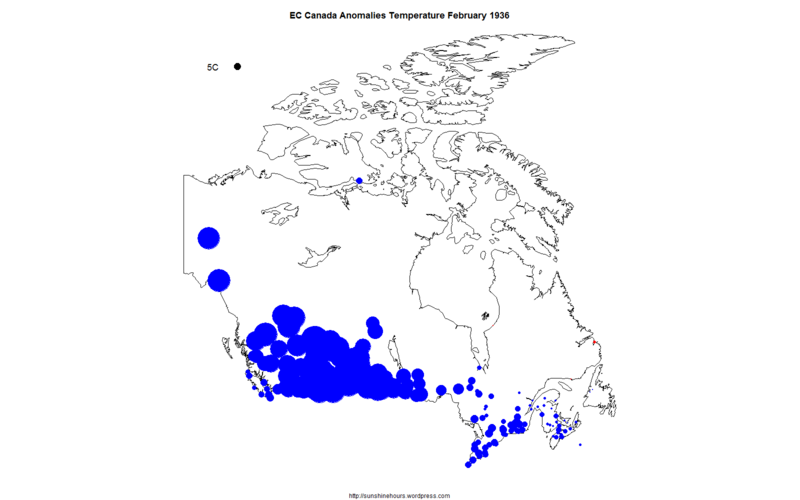 81 were more than -10C colder than normal. Animated gif of whole year at bottom. Click for bigger.